As for the holy Martyrs of Sinai and Raithu, those of Sinai contested during the reign of Diocletian, about the year 296; those of Raithu were slain about the middle of the fifth century. On both occasions, the perpetrators of these massacres were a barbarian tribe called Blemmyes, from the parts of Arabia and Egypt. Because of the Apodosis of the Feast of Holy Theophany also on the 14th of January, the liturgical services to the Holy Fathers slain at Sinai and Raitho are transferred to January 13th. Ye fled from the world's * confusion and wild turbulence * and passed over to * a state of great tranquility, * crowned with blood of martyrdom and the pains of valiant ascetic deeds. * Hence, ye dwell together with all * the Martyrs and righteous Fathers in the heights. 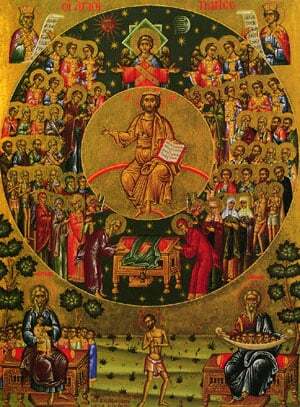 Share the feast of The Holy Fathers slain at Sinai and Raitho with an icon greeting ecard.